GOI in the form of selection of the Arunachal Pradesh Tableau for participation in the Republic Day Tableaux Parade 2019 at Rajpath. The officers and officials of department of Information and Public Relations, Government of Arunachal Pradesh received a precious New Year gift from the Ministry of Defence (MOD) GOI in the form of selection of the Arunachal Pradesh Tableau for participation in the Republic Day Tableaux Parade 2019 at Rajpath, New Delhi on the theme ‘Peace Within.’ Little wonder then their joy knows no bounds. According to MOD’s strict instruction that all the Tableaus should be on Gandhiji or Gandhiji-related, the Art Expert Dhruba Bhattacharjee and his team of artists diligently prepared the Tableau. As a matter of fact, the selection of Tableau for the Republic Day Tableaux Parade is a painstakingly long and rigorous process involving various stages of elimination. An Expert Committee is appointed to select the Tableaux from amongst the participating states of the country. After selection also the MOD gives instructions for changes and modifications at various stages. However, within a very short period and at a short notice, the IPR department successfully prepared the Tableau as per the guidelines of the MOD and has been selected which is yet another shining feather in the IPR department’s cap. The department has brought laurels to the state with its selection. Altogether 32 states sent their Tableaus for selection out of which only 14 Tableaus representing 14 states have been selected by the Expert committee. Only Sikkim and Arunachal have been able to cross the hurdle from the North-East. 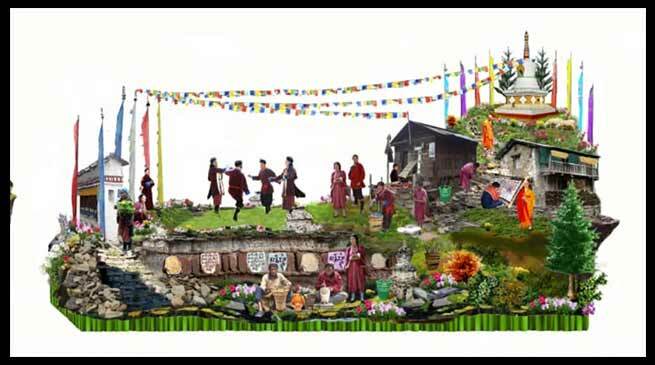 It may be mentioned here that Arunachal Tableau has been selected for 13 times over the years and in 2017 the state won the first position amongst all the states. The theme then was ‘Yak Dance’ of the Monpas. The team consisting of Dhruba Bhattacharjee, Art Expert who won state award (Gold Medal) last year, Hage Habung, Exhibition Assistant, Roto Tadi, Exhibition Artist, Sangey Tsewang, Artist and artistes from West Kameng district are leaving for New Delhi shortly. The IPR minister Bamang Felix, IPR Secretary Sonam Chombay, IPR Special Secretary Himanshu Gupta and IPR Director Obang Tayeng have congratulated the members of Art and Exhibition Cell of the department on their excellent achievement and stupendous success and conveyed their best wishes for the D-Day in New Delhi. Needless to say that the IPR department is quietly contributing to the state government not only in the field of dissemination of information on policies and programmes of the government but also in other activities that can potentially enhance the image and esteem of the state government under Chief Minister Pema Khandu.